One extent each of Cambridge Surprise, Kent Treble Bob, Oxford Treble Bob, Single Oxford Bob, St Clements College Bob, Spliced St Clements College Bob and Lakesend Bob, and Plain Bob. Rung to welcome Ginny Atkinson, second Grandchild for Hilary and Janet Atkinson. First submitted Thursday, 7 February 2019 at 20:09:23 by Kevin M Price. 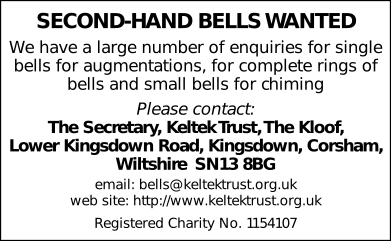 Sent for publication in The Ringing World on Thursday, 7 February 2019 at 20:09:31, and printed in issue 5626, page 183.